*You can make your own graham cracker crust or you can cheat and use a prepared crust like I did- it was on sale for only $1. Frankly, I find that when it comes to a plain graham cracker crust it is a rare occurrence for someone to be able tell the difference between a homemade and store bought anyway, so when they are on sale, I stock up. Prepared crusts are great for when you (like I am today) are taking pies to parties-you don't have to worry about getting your pie plate back. In a medium saucepan, bring 3 cups of the blueberries, the ginger, lemon juice and zest and the sugar to a boil. Meanwhile, whisk together the cornstarch and water, set aside. After the blueberries come to a boil, stir in the cornstarch mixture and cook 2 additional minutes. Remove from heat and stir in the remaining 2 cups of blueberries and the butter. Pour into the prepared pie shell. Refrigerate for at least 6-8 hours or up to one day before serving. How much do I love ice box pies? So named because they require no baking and set up in the refrigerator (the ice box), they are perfect for summer. 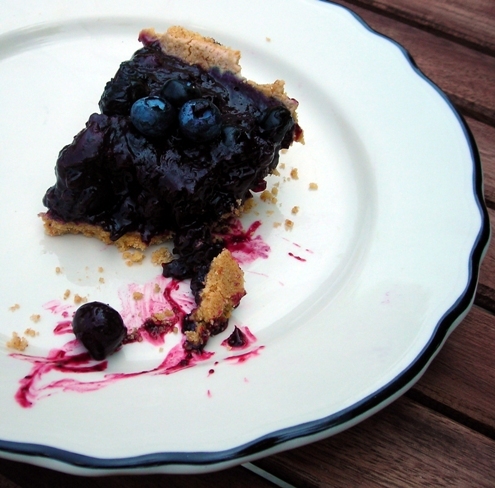 This blueberry pie shows off the flavor of the blueberries with a minimum of fuss-there isn't even a top crust to compete with the fruit. 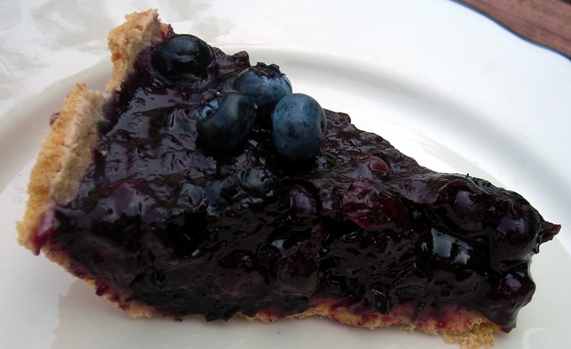 I actually like this version of blueberry pie more than the traditional lattice crust way for just that reason-more blueberry flavor. The ginger adds just a tiny bit of spice- a sort of refreshing side note to the blueberries' sweetness. Preheat the oven to 350. Using a ice cream scoop, scoop out the insides of the eggplant, leaving a 1/2 to 1/4 inch border around all edges. Discard the pulp. Sprinkle with salt and place open side down on a paper towel for 15 minutes. Meanwhile, heat the tablespoon of oil in a pan and saute the onion, carrots and zucchini. When the eggplant is ready, pat dry. Brush the skin with olive oil and broil* until just tender, about 5 minutes. Carefully remove from the broiler and place on a baking sheet or casserole. Add the thyme and the rice to the sauteed vegetables and cook 1 minute. Stuff the eggplant and top with a sprinkling of cheese (if desired). Bake for 5 minutes or until the filling has heated through. *You could grill the eggplant instead. This really came about as a way to use up some rapidly deteriorating ingredients-leftover yellow rice from burrito making, a lone zucchini) I had in the fridge. There are a few steps that might seem silly but they are worth it. Salting and draining the eggplant keeps it from getting soggy and the quick trip to the broiler insures that the eggplant will be tender and cooked through, without having to bake the stuffed eggplant (and possibly drying the filling out in the process) for a long period of time. Mix all of the ingredients together in a large bowl with a large, flat spoon. Serve at room temperature. Refrigerate any leftovers in a air tight container. I hesitated before posting this, I am not sure if one really needs a recipe for tuna pasta salad, but it came out so well today, I couldn't resist. Tuna pasta salad is one of my favorite things to take for lunch. I made the switch from tuna salad to tuna pasta salad sandwiches to eliminate the need for bread. I hate soggy bread, so I'd pack the bread separately but then I'd either forget to pack the bread, or it would get squished by lunchtime it or we wouldn't even have bread to take. Tuna pasta salad on the other hand can be a whole meal itself, so I don't have to even worry about bringing a snack. Well, maybe some fruit. I also think this a good time for my yearly reminder that the whole mayo going bad in the hot weather and poisoning you thing is a myth. That is only true if you are using your own homemade mayonnaise. Most commercially prepared mayonnaise is fairly acidic which might actually inhibit the growth of bacteria. Get the facts here. The real culprit is cross contamination from your hands or utensils or the mishandling ingredients. Mix together all of the ingredients until the sugar dissolves. Pour into a ice cream maker and churn until thick, about 30 minutes. Freeze in a freeze safer container or serve immediately for a more "soft serve" style treat. *I've heard you can make greek-style yogurt-which is thick like sour cream- by straining a double amount of regular yogurt overnight but I haven't tried it. You could also use full fat greek style yogurt here but 2% makes an extremely rich and creamy frozen yogurt and has a fraction of the total fat content. Due to some quirk in the universe, I often am able to find key limes (at Trader Joe's, Whole Foods or H Mart) for less than the the cost of the more common Persian limes. Normally I just use them as I would a regular lime, but some times their slightly tarter flavor needs a place to shine. I've made a myriad of key lime recipes: the ubiquitous pies (both with and without coconut), sherbet, fruit salads, and even bread and curd but I think one of my favorite things to make with key limes is frozen yogurt. Homemade frozen yogurt is a thousand times better than what you can get at a store: the perfect balance of creamy and tangy and the texture is phenomenal. The tart key limes really bring out the tartness in the yogurt without being over powering. I also think regular limes or even oranges or tangerines would be a good substitute for the key limes if you don't have my luck in finding them. Note: a couple of people have emailed me about the straining the yogurt option saying that it was a cheaper alternative to the greek yogurt that works just as well. Since I haven't tried it, I don't know if it works just as well. However, I am not entirely convinced that it is cheaper to strain your own. I bought (store brand) greek-style yogurt for $3 for 16 oz, so the total for the recipe was $6. A 32 oz container of regular plain (store brand) yogurt was $3.50. Since you'd have to buy twice the amount of regular yogurt to make faux greek-style yogurt, your total for this recipe would be $7. This means that straining the yogurt yourself is both more expensive and more work. I'd only substitute strained yogurt if I could no longer find the greek-style. Using the greek-style yogurt I went from opening the container to eating frozen yogurt in less than 40 minutes and saved a dollar. Of course, prices might vary depending where you live, but I did do my price comparisons at two national chains. Place all ingredients in a food processor or blender, pulse until a thick paste forms. Toss with 1 lb cooked pasta. Garnish with mushrooms and serve. We have gone asiago crazy! My husband recently discovered how much he likes asiago and has been sneaking it into everything. So when I went to make pesto for dinner tonight, I swapped the parmesan for some aged asiago. It is really good, asiago has a fairly assertive flavor which seems to bring out the pepper flavor in basil. I love it when such a simple change can bring new life to a old favorite. Preheat oven to 375. In a small bowl, whisk together all of the sauce ingredients. Slice the pork loin into 2 inch thick slices. Place in a baking dish with a lid. Cover in sauce, cover and bake 1 1/2 hours or until pull-apart-with-a-fork tender. Use a fork to shred the pork. Serve hot on sesame buns. We couldn't decide between making Southern style barbecue pork or something Asian so we decided to meld the two together in a sort of China meets Japan meets the Carolinas pulled pork. It is beyond tasty and despite the long list of ingredients, a snap to make. In a small pan, bring the rhubarb, sugar and water to a boil. Lower heat and stir occasionally until the sugar has dissolved and the mixtures has reduced into a light syrup, about 10 minutes. Strain through a mesh strainer and press the rhubarb bits* (they will be pretty mushy) with the back of a spoon to release all of the juices into a bowl. Add about a tablespoon (or more to taste) of the syrup to the bottom of each cup and top with club soda. Serve immediately. *I sort of like to eat the leftover mashed rhubarb rather than throw it away, but you can certainly just toss it. As someone who doesn't like water and doesn't like to drink juice with meals, club soda is my fallback beverage. While the bubbles momentarily fool me into thinking that it is more than just water, it is still pretty plain and boring to drink day after day, especially in the summer when my beverage consumption triples. Enter the homemade soda. 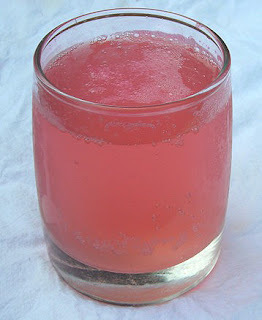 My new favorite flavor to make is rhubarb. Just barely sweet, and with a clear rhubarb taste it is the perfect beverage when you don't want plain water but when regular soda or juice is just too much. Whisk together the egg, milk, and vanilla and vanilla paste (if making vanilla bean doughnuts). In a separate bowl, whisk together the flour, yeast and either the cocoa or the matcha (if making chocolate or matcha doughnuts). Slowly stir the milk mixture into the dry ingredients until a dough forms. Flour a counter top and knead, adding more flour a tablespoon at a time as needed, until a very slightly sticky, elastic ball of dough forms. Place in a buttered bowl, cover with a towel and allow to rise, about 1 hour or until it has doubled in bulk. Punch down, and roll it out on a floured surface until it is about 1/2 to 2/3 of an inch thick. If you have a doughnut cutter, use that to cut out the doughnuts. If not, use a small cutter to make doughnut "holes" or improvise using a drinking glass or large cookie cutters and smaller cutters to make the holes. You could also make round, biscuit sized doughnuts with no holes. Place the doughnuts on 2 greased cookie sheets, cover with a towel and allow to rise an additional hour. Preheat the oven to 375. Melt the additional 3 tablespoons of butter. Pour some (granulated) sugar on a plate. Bake the doughnuts exactly 6 minutes, then remove to a wire rack. Brush each doughnut with melted butter and dip in sugar. Serve hot, although they are still pretty good at room temperature. Store up to 1 day (but eating them immediately is preferred) in a air tight container. I've seen various recipes for baked doughnuts and was wanted to give it a shot. I am sure doughnut purists would sneer at the mere thought of a baked doughnut but I honestly didn't think I'd miss the frying. Doughnuts, while typically fried, are not like fried chicken or onion rings where the crisp crust you can only get from frying is the star, and the best doughnuts don't have a trace of grease. I did some experimentation and came up with this master recipe, with three variations. It is incredibly easy, it basically just a sweet bread dough, very low in fat, light and tender. The addition of the various favors (why don't bakeries flavor their dough? I've thought for years that would the next logical step in doughnut making) give you a very flavorful sweet that only needs a roll in sugar. In a large skillet, heat the oil. Add the onion and cook until soft, about 5-8 minutes. Add the frozen spinach and the defrosted artichoke hearts and saute about 2 minutes. Cover and lower the heat. Cook for an additional 2-4 minutes. If there is any water remaining in the pan (there wasn't for me but there could be), drain it off. Spread into a thin layer on the pan to cool. When cool, place in a large bowl and stir in the sour cream, paprika, thyme and Worcestershire sauce. Cover and refrigerate at least 1 hour or up to one day before serving. *I like Daisy brand** light sour cream for dips. It is very thick and creamy but much lower in fat. My mom came over for lunch earlier in the week. Since it was such pretty weather, I thought we'd eat outside so we had picnic food: deviled eggs, tuna pasta salad, veggies, this dip and a slice of icebox pie. I wanted to make the dip extra chunky and thick so it was basically a second serving of vegetables. I served it with thick carrots, celery and these pumpernickel pretzel sticks** that are my new favorite pretzel. I think it would also be good as a topping for a baked potato. **These are just my own opinions and not sponsored by these companies in anyway. Heat oil in a large, heavy, tall saucepan. Sprinkle 1 tablespoon each paprika and cayenne on the chicken thighs. Add the onion, garlic and chicken and saute until the chicken is almost completely cooked through, it should look white on each side. Add the rest of the spices, the canned tomatoes, chiles, kidney beans, tomato paste, hominy (you might need to break this up a little with the back of a spoon) and Ro-tel. Cover and cook 15-20 minutes, then remove the cover and cook an additional 10. Serve immediately. Leftovers refrigerate and freeze well. *I just open the can and run a knife through it to cut them up. I know chili isn't exactly what springs to mind when you are thinking of what to make for dinner during the warm weather months but this chili is surprisingly quick to make and only uses one pot. I have been wanting to make something using hominy for a while now. When I was a child we'd occasionally have it (somewhat oddly) for breakfast with breakfast sausage but it in the years since I've noticed how well it pairs with tomato. When boneless, skinless chicken thighs (so moist and juicy and only nominally higher in fat than chicken breasts) went on sale this week I thought a chicken chili might be in order. Matt said it was one of the best chilis either of us has ever made which is high compliment from someone who prides himself on his chili prowess. It uses a fair amount of canned goods, which is good (you probably have most if not all of the ingredients on hand) but it doesn't have the icky "canned" taste. It is very fresh tasting. The trick is the tiny bit of tomato paste for a depth of flavor. One the day before you want to eat the gelato, allow the mint leaves to seep in the milk overnight in the refrigerator. The next day: Pour the milk through a sieve into a saucepan. Scald the milk, then remove from heat. Meanwhile, beat the yolks and sugar together until fluffy. Whisk in a few tablespoons of the scalded milk, then add the egg/milk mixture into the remaining scalded milk. Return to heat on low, stirring occasionally and cook until the mixture coats the back of a spoon. Strain and refrigerate until cool. Add to a ice cream maker and churn until frozen and creamy. Remove to a freezer safe container and freeze until hard, about 1-2 hours. Allow to soften slightly before serving. When we planted mint a few weeks ago I had it in the back of my mind that it might be fun to make some homemade mint ice cream. When it came down to it though, I decided to go the slightly lighter route and make gelato. Gelato is just as tasty but because it is made with whole milk and not heavy cream, has about a 1/3 of the fat. The slightly more subtle texture of gelato worked well with the fresh mint too, it ending up tasting very light and fresh rather than super rich, which really complimented the delicate flavor of the fresh mint. It was also exciting to use mint from the garden-it is the first "harvest" of the year! In a large pot, saute the onion and garlic in olive oil until softened. Add broth and bring to a boil. Stir in the pasta, salt, pepper and nutmeg. Simmer for 3-5 minutes. Stir in spinach. Cook about 5 additional minutes. To serve: arrange the desired about of meatballs in the bottom of each bowl. Ladle the soup on top, serve immediately. This soup is similar to Italian Wedding Soup in that it has meatballs and a chicken stock based broth, but it has some differences. It is made with spinach instead of endive or escarole, it has pasta (which some versions don't), and there are no eggs in the broth and it is a little quicker to make. But no matter, it is wonderful soup in it's own right and besides, Italian Wedding Soup doesn't have anything to do with weddings at all-it is really a mistranslation of "minestra maritata" which just means two things that go well together-a marriage of flavors if you will. This soup has the perfect marriage of flavors and is light tasting yet substantial enough to serve as a meal. In a small bowl, whisk together the butter, buckwheat flour, flour, eggs and milk. Allow to sit 30 minutes. In a pan, heat the olive oil. Add the zucchini and the onion, cook until the zucchini is soft and the onions are starting to caramelize, about 20 minutes. Meanwhile, sprinkle the steak with salt and pepper and sear on a hot pan. For a 1" thick steak, cook on high heat for 2.5 minutes on each side for rare steak. Remove steak to a pan and cover with foil. Let sit for 5 minutes and then slice thinly. Grease a crêpe pan. Place over a medium flame and heat the pan. Add about 1/2 cup batter to the center of the pan, tilting it to cover the bottom. Cook until just browned, about 2-3 minutes, then flip. Cook until set. Repeat for remaining batter. Stack each crêpe on a plate and cover until you are ready to serve. To serve: place some of the zucchini and onion and the steak on 1/2 half of the crêpe. Fold it over. Serve immediately. Crêpes are not any harder to make then regular pancakes, but they seem a little more fitting for dinner. I recently bought a crepe pan and have been wanting to try it out. These savory crêpes are some times refered to as ""galettes" (if my high school French isn't failing me) and are slightly thicker than the white flour only dessert crêpes. Squeeze a lime into the bottom of a high ball glass. Pour in the vodka, when pour in the ginger beer. Serve immediately. Ginger beer was on sale this week and I couldn't resist picking some up. While the nonalcoholic drink is wonderfully spicy and delicious on its own, it also makes a great mixer. The Moscow Mule is a fun 1950s era cocktail that is credited with popularizing vodka in the United States. It is generally served in a slightly smaller glass (and some times a 5 oz copper cup!) with a closer ginger beer to vodka ratio, but this version is a more casually sippable drink, perfect for a backyard party or Summer dinner. It also makes a great addition to the From Retro With Love round up Laura is hosting. Preheat oven to 350. Grease and flour or line* 12 wells in a muffin tin. Set aside. In a large bowl, mix together the eggs, oil and buttermilk. Add in all of the dry ingredients, including spices. Mix thoroughly. Stir in pecans and zucchini. Fill the prepared wells about 3/4 of the way. Bake 30-40 minutes or until a toothpick inserted into the center of the center muffin comes out mostly clean. *On a side note, I really like a new Martha Stewart cupcake/muffin liners. You can still see the pattern of the liners even when the cake is dark unlike most Wilton liners where the pattern/design totally disappears with a dark batter. 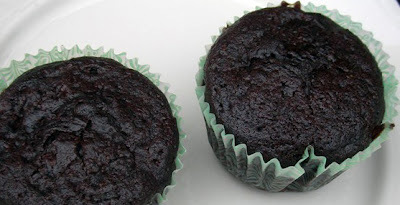 I have sort of mixed feelings about chocolate zucchini muffins. I have seen recipes for years for various incarnations with and without chips or nuts and never got around to making them. I sort of liked the idea, but it also smacked of "here's a fun way to trick your kids into eating vegetables", which I always find unappealing. Anyway, Matt was reading a cookbook the other day and they had recipe for chocolate zucchini muffins. He had never heard of them before and immediately wanted to make them, but we decided to hold off until this weekend when his parents would be in town. I am glad we did, the recipe was sort of bizarre (almost an equal amount of sugar as flour and some other oddities) so I scraped it entirely and made my own. The recipe I came up with was much less sweet, and with (I bet) a stronger chocolate flavor. I also don't like nuts in my muffins so I made two plain and stirred nuts into the rest. The muffins are very, very moist and not too sweet so you don't run into the whole "are these muffins or are these cupcakes debate".